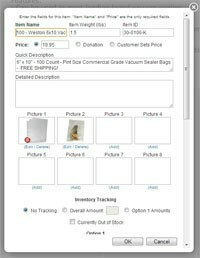 Easysite.com claims to be the easiest way to create an online store complete with shopping cart and eCommerce integration. Easysite's online store page has just gotten easier to use when you build your own website. Customers that have tried the online shopping cart of Easysite's website builder agree, it just doesn't get any easier than this. Online Store with Shopping CartWhen a customers starts to use the online store page of their Easysite website, they simply enter their PayPal email address account into the entry on the page. Once this is done, their store is automatically hooked up to their PayPal account and they can start taking orders online that very minute. This is a huge advantage to other website building systems that require a merchant account and a separate secure certificate just to process a single order. With Easysite's integration with PayPal, customer that sign up with Easysite can have a store page up and running in a matter of minutes. Posting items to your own online store page is a simple process as well. There is no programming or special technical skills required. Everything is point and click. In fact, all that is needed to post an item is the item name and the price. Within the "Add Item" dialog there's a lot more features that are simple to use and understand. For example, website administrators can easily add up to eight pictures per store item. There are also "choices" for each item. This is useful for items that have options, like shirt size or color. Within each option additional charges can be added for certain options. Online Store Item EditorThe newest addition to Easysite's online store page are the integrated inventory controls. These controls let you define how you want to handle inventory control. For example, you might have an endless supply of something, in which case you can select no inventory control. If you have something that has a limited quantity, you can select the "per item" option to set the amount that you have of that particular item. The third option is to have inventory amounts tied to particular choices. This is useful for an item that is limited by the style or color. For example, you might have a t-shirt that you're selling online and you might have 10 smalls, 5 medium and 3 large sizes. With Easysite's new controls, you can set those amounts when you add or edit a particular item in your website's online store page. The other neat feature with the inventory control, is that your items' inventory amounts will automatically be kept up to date. This means when someone buys an item, the amount you have of that item listed on your website automatically decreases. This is a great feature for customers that visit your online store. It actually keeps them from placing orders on something that is no longer available or in stock. Another unique feature with Easysite's online store page builder is the ability to set the price field to "donation" or "customer sets prices" as opposed to entering in a usual dollar amount price. This type of flexibility within an easy-to-use online store page is rarely seen and it shows that Easysite is responsive to their website customer request. 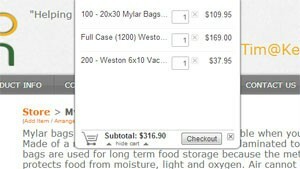 Online Store BuilderThere's also a feature to "synchronize" your item choices with the pictures of the item. This means when a customer selects a green dress from the list of choices, the item page can actually update the picture of the item being displayed to show the picture for the green dress. 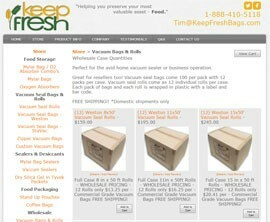 Items within the online store page can also offer an entry for the weight of an item. This lets you set up shipping costs based on the weight of an item and can be useful for calculating any additional handling charges. Overall, Easysite claim to be the easiest way to create an online store page seems unchallenged at the moment. 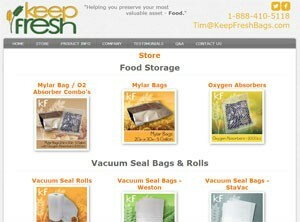 The online store page is a great feature for businesses that need to create their own website. Anyone looking into how to create a website should consider the value of the store page and the great features that come with it. The page looks great as it is automatically organized into departments, which makes it easy to navigate. When a customer visits an online store built with Easysite's website builder, they have the option to rate and review products right within a website. This let's other customers know what they thought of your items. Ratings are averaged and appear as a star rating above each product. Lastly, another cool new feature that is exclusive to Easysite's Professional website building level is the drop down shopping cart. Every time your customer adds an item to their cart, the cart drops down from the top of the site. They can then expand this control to see the entire content of their cart, adjust the amounts of each item as well as keep track of the running total of the item in their shopping cart.